MASSIVE news!! Mexican songwriting legend Marco Antonio Solis is teaming up with the sibling duo Jesse and Joy for the US Y La Historia Continúa Tour following its sell-out success across Mexico!! These phenomenal musicians will make their way to The Forum on Friday 13th October 2017 – be there! Hit the “Buy Tickets,” button above now to be sure of your place!! 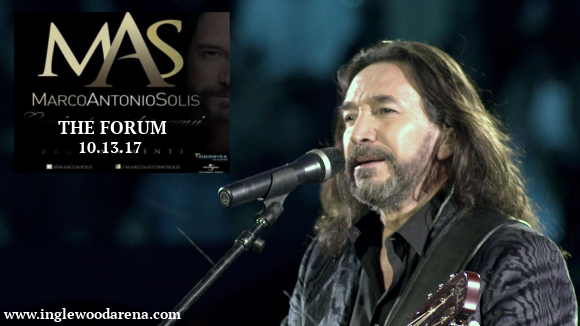 On this special tour, Marco Antonio Solis will perform all your favourite songs from across his huge repertoire of 18 studio albums, including the much-loved hits "O Me Voy O Te Vas" and "Si No Te Huberias Ido," in addition to fresh gems such as "De Mil Amores" and "Tres Semanas.” Up-and-coming stars Jesse and Joy will get audiences in the mood for the superstar with their array of modern hits! The tour will mark the second appearance of the two acts together, after Jesse and Joy joined Marco Antonio Solis for his 40th anniversary celebratory concert in Los Angeles, where they performed "Recuerdos, tristeza y soledad,” as a trio! Throughout the tour, the duo will make appearances as special guests, joining the award-winning Latin musician live onstage. Don’t miss out on this unique must-see experience for all fans of Latin pop! Book your tickets to see Marco Antonio Solis and Jesse and Joy live TODAY! !